Part of Smith's Parish's crest, from that of Sir Thomas Smith. His coat of arms, copyrighted by his family, members of which still exist today, is exactly what is shown on Bermuda's Smith's Parish crest. Used with exclusive permission from the copyright owners. Do not copy. Smith's Parish, one of the nine counties or Parishes of Bermuda of about equal size, is on Main Island. It has sea frontage on the South and North shores and southern side of the inland lake of Harrington Sound. It is named after one of Bermuda's Elizabethan patrons, Sir Thomas Smith or Smythe (1588-1624). He was an English aristocrat with humble beginnings who raised himself by his integrity to great responsibilities and riches. He was knighted by King James and became the first Governor of the famous East India Company and first Governor of the Somers Isles Company - Bermuda - an office he held at the time of his death in 1625. Because he supported British efforts to discover a Northwest Passage to the Orient, his name was given by explorer William Baffin to Smith's Sound on the Canadian coast of British Columbia. The Bermuda Historical Society has two prints of him, in one frame, the top one showing his upper torso and the lower the same but with a hat on, in ruffled collar and a legend reading "Thomas Smith Equitis Aurati etc. Vera Effigies Praeclariss Viri Dom." He was Chief organizer and 1st Governor of the East India Company, First Treasurer of the Virginia Company 1607-1619, Governor of the Somers Island Company 1615-1621 and again 1623-1624 until his death. Great merchant, capitalist, exponent of exploration, the friend of R. Huckluyt. He was the solid man of business under whom London merchants invested 80,000 pounds in Virginia and 60,000 pounds in Bermuda and held on when hopes of profit were small. Sir Thomas Smith was a special British Ambassador to Russia. He was buried in 1624 at Ashford in Kent. Much of his vast fortune was devoted to the endowment of charities. He was one of the illustrious band of gentlemen "Adventurers" who invested in the Bermuda Company to colonize the Bermuda islands from 1615 onwards. He was the largest shareholder in the original Smith's Tribe, later Smith's Parish. However, because he never visited his Bermuda domain, early settlers called referred to the Tribe as Harris's Bay. (Harris Bay today is one of the residential sections of this attractive central Parish for sightseeing purposes. In addition to Smith's Parish, Smith's Island (61 acres, in St. George's Harbour in Bermuda) is also named after him, as are several places in Virginia and Smith's Sound in latitude 75 North to the West of Greenland. Smith's Island in St. George's Parish was Bermuda's first settlement. It was here that Carter, Chard and Waters, reputedly the three Kings of Bermuda from 1610 to 1612, settled when they were the first accidental permanent colonists in Bermuda. They built cabins of palmetto, planted beans, water melons, tobacco, maize, fished of the coast, hunted wild hogs, salted bacon and fish they caught and even made a fresh water catch. When the Plough arrived from England on July 11, 1612 with the first party of planned colonists, it went first to St. David's to discharge them then went two days later to an anchorage on the south shore of Smith's Island. Carter, Chard and Waters showed Governor Richard Moore the varieties of garden produce they had grown. Moore was delighted because the Somers Isles Company in London had supplied him with 81 varieties of seed to try in Bermuda. Many of the first European crops Virginia and later American colonies saw were planted on Smith's Island. The first planned settlers made rock ovens for their food from the local limestone until they moved to St. George's Island and Town of St. George in the summer and autumn of 1612. Given that Smith was the first Governor of the East India Company, it is an interesting footnote that East India Company tea was sent to the bottom of Boston Harbor in Massachusetts in December 1773 just before the American Revolution. The Tea Act legislated in London earlier in 1773 allowed the East India Company, trading from London, to sell more East India tea at a cheaper price, in America and world wide, via British merchant ships belonging to the East India Company. When the American Revolution started, British tea was a forbidden import in all American ports. Those interested in tea will appreciate the distinctive "original tea" packaging of tea from the East India Company today. The Parish is served by the following routes, some for a much longer length of time daily than others. See the schedule available free from the bus terminal in Hamilton and note its times on Monday to Friday, Saturday, and Sunday & Holiday, as well as where the routes go and do not go. # 1 route (Hamilton to St. George's, via Harrington Sound Road, South Road, Castle Harbor, Harrington Sound Road, The Caves and Grotto Bay). # 3 route (Hamilton to St. George's via Middle Road, Harrington Hundreds, Knapton Hill, Harrington Sound Road, The Caves and Grotto Bay). #10 route (Hamilton to St. George's via Palmetto Road, Aquarium and Bermuda Perfumery, North Shore Road). #11 route (Hamilton to St. George's via Black Watch Pass, Aquarium and Bermuda Perfumery, North Shore Road). A cove on the east side of Sue Wood Bay (in Devonshire). One of the several local place names referring to members of the Williams family, a line of Bermudian seafarers. East of Flatt's Village and Palmetto Bay, it is now merely an ornate iron tower and old bridge curiosity attached to an old boathouse on the shore of Harrington Sound. Once the property south of it on the other side of Harrington Sound Road and part of it was a mansion, connected to the tower by a pedestrian bridge. The boathouse was accessed via the Manor House bridge. The property, bridge and boathouse were built in the 1920s by an American millionaire, Charles Ledyard Blair and his first wife who was related to the Bermudian Butterfield family. Blair was from New Jersey (Blairstown) and imported non-Bermudian architecture. Later, it became the upmarket Deepdene Manor Hotel, which operated until the 1970s but is no longer around. Now it is part of an upmarket real estate condominium development for residents only - not for visitors unless they are able to rent privately for a short period from any individual owners who might be interested. The original manor house still stands as part of the condominium development but has seen many other condominium units added to it. The original developer was Bermudian the late L. P. Gutteridge, a very well known and much-liked realtor, businessman and politician. Some of his grandchildren still live in Bermuda. The aptly-named road Manor House Drive leads up to it. Manor House is still a corporate entity. Where Harrington Sound Road meets Devil's Hole Hill in this Parish is one of the extremities of Harrington Sound. There is car, moped and scooter parking on the premises off Devil's Hole Hill. By bus, route 1 is within walking distance and route 3 is even closer. Devil's Hole is a charming natural aquarium, once a subterranean ocean cave. 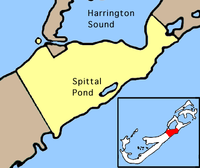 It may surprise some locals and residents that it is fed by the waters of the South Shore over a mile away, via a winding underground estuary, not those of Harrington Sound so close by. It got its name when the cave roof collapsed and the wind rushed through the hole. It produced eerie sounds that were considered by superstitious people to be the moans of the Devil. Fishermen built walls around it to ward off the Devil and kept their catch fresh in its cool waters. Passers-by, curious about what lay behind the walls surrounding the cave, became its first visitors in the early 1830s. It is Bermuda's oldest tourist attraction. Now its residents include fish, a 6 foot long Moray eel by the name of Henry, plus two large green turtles called Romeo and Lady Hook. Enjoy "fishing" for the turtles and reef fish via a harmless hook with no bait. The entry fee is US or Bermuda $10.00 per person, free for children under 12, $5 for children 12 to 18 and with US$50 annual membership. Special features are its (limited supply of) imported from El Salvador marble turtles in various sizes and prices, with marble feet and a marble tail, in five pieces that can be glued together or bound together in another way, found nowhere else in Bermuda. They are gorgeous! Called such in honor of Briton Lucy Harrington, Countess of Bedford and original patroness of neighboring Hamilton Parish in the 17th century. One of the many roads in Harrincourt, in another reference to her. The second half of the name of the residential and scenic area is after the medieval English name of "hundreds" which meant a subdivision of shires which furnished 100 men-at-arms in the army of a feudal lord. The northern section of Harrington Hundreds starts on Harrington Sound Road and then connects with Knapton Hill and the South Road, going east or west. It has marine views on both sides if you take a rented moped or periodic bus. At either end, note the hills. Also named for Lucy Harrington, the Smith's Parish part of the sound begins at Flatts Village. The sound is an inland lake, mostly in Smith's Parish and Hamilton Parish, only slightly in St. George's Parish. Overlook it and its islands after climbing Harrington Sound Road. See pretty private residences and estate roads until Harrington Hundreds Road meets Knapton Hill Road. From there, see the South Shore coast below. Its only entrance of the Sound to the sea is under Flatts Bridge, via Flatts Inlet. Formed as a depression between dunes, Harrington Sound once supported a large fresh-water marsh before being inundated with sea water approximately 6,000 years ago. A unique habitat rings Harrington Sound in the form of a sub-tidal notch, which cuts back into the rock several metres. Created by the boring action of sponges and bivalves, this notch supports one of the most diverse sponge communities in the west-central Atlantic. Whilst there is only one surface connection between Harrington Sound and the surrounding ocean, numerous caves form submarine connections and support a unique fauna including many of Bermuda’s endemic species. Hundreds of thousands of years ago, when the sea level was much lower, huge dissolution caves formed in the area of Harrington Sound, particularly in the Walsingham formation. Spectacular calcareous formations decorate these caves. A large sink hole in the Walsingham area, Walsingham Pond forms a protected marine habitat where endemic species including the killifish and a rooted Sargassum can be found. It is gorgeous for fishing, swimming, sunfish sailing, kayaking and viewing. There are lots of bays, caves, cliffs and coves, but not many beaches. The Sound marks the lowest point on the Bermuda sea platform. It is quite deep, about 23 meters (about 70 feet) at its deepest point (off Devil's Hole). Its geological formation is not yet fully explained. However, it is not the crater of an extinct volcano as is sometimes assumed. The islands in the parish include Turtle Island. Some are inhabited year round. Going east, travel along the southern and southeastern extremities, with marvelous views all the way of this outstanding body of water and its islands. The stretch between Palmetto Bay and Devil's Hole is particularly pleasant. At Devil's Hole, stay left (unless you want to divert to the right to get to Devil's Hole Hill) and pass unusual Turtle Island in Harrington Sound. From here on, the road goes inland somewhat. A little way past the entrance to Broken Hill Road on the right, you'll reach the eastern boundary of Smith's Parish and enter Hamilton Parish. The view overlooking Harrington Sound is stunning. Harrington Sound has gone through huge changes. When Bermuda's population was much smaller than it is now (the fourth most densely populated country in the world), there were significant populations of clams, conchs, scallops and huge stands of branching corals. All have disappeared in any quantity although some clams remain. No commercial fishing is done. Access this tranquil place via Harrington Sound Road. See all manner of park-like scenes. It is perfect for walkers and photographers. It has a one way road emerging on the South Road. (Sometimes called Gallows or Gibbet's). 1 acre and Little Gibbet, close to shore, Smith's Parish. near the entrance to Flatts. They are not accessible to the general public except by water, up to the high tide mark. The # 10 and # 11 buses stop on either side of the North Shore Road nearby. They can be clearly seen from the North Shore Road where it meets Jennings Land Road, and from the Railroad Trail nearby. They guard the entrance to Flatts Inlet. As a seafaring island, Bermuda inherited and followed many of the same customs as its mother-country, the UK, including use of the gibbet. Gibbeting was one of the methods said by Tacitus and Cassius Dio to have been used by Boudica's army in the slaughter of Roman settlers in the destruction of what are now Colchester, Essex, England, London and St. Albans in AD 60-61. In Bermuda, the islands above were used for this purpose because it was not on the mainland, was not in a populated area where sights and smells of decaying corpses could offend sensibilities. Both were once sites for executions of witches by burning at the stake and felons, not just by hanging but also gibbeted. One hanging was in 1681, a slave from New England, Indian John. He was the property of William Maddigan who then lived at Orange Grove not far away in the same parish. Indian John escaped, tried to set fire to the house, seized a pistol and intended to shoot every member of the family, but was captured. He was sentenced by Governor Florentius Seymour to be executed, have his head cut off and be quartered and the head and quarters put on poles for all to see, in other words gibbeted. Another slave, Quashi, was hung there in 1754 after being convicted of murder of his master John McNeil. Altogether, there may have been as many as 17 cases of gibbeting in Bermuda. Bermuda is the only place in the world with an island named after a gibbet. It was also the only place in Bermuda where the gibbet was used as an additional refinement to hanging. Persons hung had a less humiliating end, they could be buried decently. But bodies gibbeted because of the seriousness of their crimes were left there to smell and rot, and were sometimes tarred to lengthen their displayed broken corpses and prolong their public displays, as a deterrent to others. Today, the bare pole is not an old gallows but an old standard for a navigation light. Halfway Rock. (Also Boat Rock). A limestone stack just in Smith's Parish, slightly west of Hamilton Parish. It is offshore, halfway between The Castle fort on Castle Island and the fort at Devonshire Bay. It was unmanned but important before the Military Road permitted east-west land travel. It was a military bearing mark on the water route between the two important fortifications. Little Gibbet. Closer to shore, next to Gibbet's Island. The tiny but pristine beach is apparent only at high tide and legally accessible only by water. But it's worth it. The views, west to the Royal Naval Dockyard in Sandys Parish and east for a unique impression of Flatts Inlet, are superb. Another bonus is swimming southwest of Little Gibbet, with its shallow water and soft sand base. You can swim from virtually any point in Flatts Inlet, but note the often flowing currents. Turtle. This small privately owned island of 1.5 acres is east of Devil's Hole on the south side of Harrington Sound, with a kind of cable car system to pull it to the mainland not far away. From the air, it has the general shape of a turtle. This nice residential area is now mostly a short cut via a hilly section from the North Shore Road to the Middle Road. But at one time it was a golf course. The # 10 and # 11 buses stop on either side of the North Shore Road and the # 3 bus on either side of the Middle Road. It is named after Richard Jennings, who came to Bermuda in the mid 17th century. He sired John Jennings Sr. who had a son also named John. They inherited property in both this parish and Southampton Parish. South Shore, off South Road. Named after Captain John Smith, the famous 17th century British explorer who mapped Bermuda (which he referred to by the official first name of the Somer's Isles and much of Virginia, was instrumental in getting Princess Pocahontas to the UK and much more in both Bermuda's and Virginia's history. (How he sailed to and from Bermuda is still a mystery). Public. Only public beach in this parish. Very nice, especially at low tide. A personal favorite. Reefs are attractive, with care. Lifeguard on duty in summer. Soft drinks, snacks, fast food, etc. are often available from a licensed purveyor in a van on the premises. Basic bathrooms (toilets) available. Located between Pink Beach Club and Watch Hill Park, not far from Devil's Hole Aquarium. Popular with locals and tourists, families and youngsters, especially in summer. Can get noisy when groups gather with loud music. Parking for vehicles, grassy picnic area. Bus routes #1 which stops conveniently on the South Road nearby or #3 (which stops further away, at Devil's Hole). Don't be tempted to use bus routes #10 or #11 unless you are a good walker and used to heat and humidity and traffic noise for the 1+ mile walk. When the concrete ramp to the beach was built, it was assumed - wrongly - that people in wheelchairs could access. But it is far too steep. Out of sight of these views but to the left are more pink beaches, private, belonging to the appropriately-named up-market Pink Beach Club and Cottage Colony. A prime residential area of Bermuda, one of the top three such areas. It is named after John Knapton, a very successful mid 17th century merchant whose wife Elizabeth was the daughter of Anthony Peniston (or his son by the same name) who showed "goldsmith" as his trade in the records of the Bermuda Company and was also its treasurer. He left a will dated 1654. It begins as a turnoff to the left off the South Road just a little east of St. Mark's Church, and ends where Harrington Sound Road meets the Devil's Hole part of Harrington Sound. It offers magnificent views of the South Shore to the right. It climbs higher and higher, going past some beautiful private homes and a series of residential streets in the middle. Then it dips down to sea level again. The foliage, houses, views of the South Shore to the south, Harrington Sound to the north and "skyline" aspects make it most interesting. This is one of the three main roads. It begins at the junction of the North Shore Road and Harrington Sound Road going west. It goes up Flatt's Hill, passes Penhurst Park and the Cable & Wireless Teleport on the hill to the north. For sightseeing on the fly, it's the best way to access the park, or to continue east past Store Hill (which connects Middle Road with the North Shore Road and has access to the Bermuda Railroad Trail). The road passes some interesting private homes and gardens before the intersection with Verdmont Road to your right (to Collector's Hill and South Road), Jennings Road to your left (to the North Shore Road) and the interesting old Whitney Institute School, also on your left. Then it comes to the top of Flatts Hill. At the bottom, Middle Road ends, splitting off into Harrington Sound Road to the right and the North Shore Road ahead. The # 3 bus stops along the Smith's Parish portion of Middle Road. The Smith's Parish section of this scenic, sometimes winding, main road begins just west of the entrance to Penhurst Park, goes past the area leading to the Gibbet Islands, then into Flatts Village, and ends at Flatt's Bridge. There are seascapes all the way. If you stop to admire them, avoid doing so during rush hour traffic. Bus routes 3 (Middle Road), 10 and 11 (North Shore Road) stop nearby. Between the Middle and North Shore Roads, a little west of the junction of Middle Road and Store Hill, on the Middle Road. 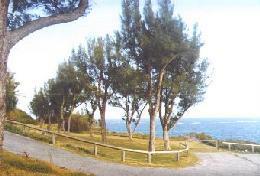 This 15 acre park offers superb walking trails and panoramic views of the North shore coastline and ocean. Across the North Shore Road, there's a swimming area off the rocks (with no beach) as well. It's a great place for a picnic, rendezvous or walk. In December 2002, film stars Michael Douglas, wife Catherine Zeta Jones and son Dylan Douglas, 2, planted endemic trees in a 4-acre plot. Mr. Douglas is the son of Kirk Douglas and Bermudian former actress Diana Dill Webster. He and his family purchased a $2.5 million home, Longford, in Warwick Parish, in 2001. Diana Dill Webster's family has lived in Bermuda since the 17th century but her primary home is in California. 51 South Road. One of the Anglican Churches of Bermuda. The # 1 day time bus stops on either side of the South Road nearby. The cornerstone of the church was laid in 1847. It is a fine example of Gothic revival style. One of the most charming of the parish churches and its spire, designed by Dr Henry Hinson, one of the loveliest. Consecrated in 1849, it took the place of Harris’ Bay Church which stood on the site of the present graveyard from the early 1700s until 1846; a simple, silver chalice dated 1676 is a treasure left from the old church. Land for St. Mark’s was given by sisters, Sarah Trott and Mary Sears. When first built, the church was a plain, rectangular building with a gable roof and arched windows. It remained a country church until transformed under the leadership of The Reverend George Tucker and parishioner Jeremiah Scott Pearman, who made the care and ornamentation of the church his life’s work. They blessed the building of a Gothic tower, measuring more than one hundred feet, and an octagonal, buttressed spire, above which rose a cross. Julian Tucker, the chief mason, skillfully executed the work and later built a comparable steeple for St. Paul AME Church in Hamilton. The pews were made from mahogany logs washed ashore in the Turks Islands and later shipped aboard the HMS Beta to Bermuda. The altar, the exquisite reredos and pulpit, all made of cedar, were artistically carved by Arthur Wilkinson of Bailey’s Bay. The font was fashioned from Bermuda limestone by convicts. The bells which pealed for the first time in 1911 were given by the congregation in memory of Archdeacon Tucker, St. Mark’s well-loved rector for nearly forty years until his death in 1908. In July 1998 eleven archaeologists including one from the College of William and Mary found more than they bargained for at a dig in the graveyard. The excavation revealed remnants of the church's two older structures. St. Mark's, then known by an earlier name, was originally built in a plot of land across the street from its present position in the mid 1600s and was rebuilt at the same spot after 1712. It was not until the church fell down during a renovation that it was rebuilt on the other side of South Shore Road. The excavation revealed remnants of the church's two older structures, some of their walls. 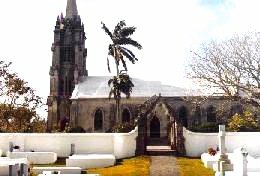 Ministers of this church, more than any other church in Bermuda of any religion, have been the subject of much prolonged controversy by quarreling parishioners, first in 1867 when they prevented the minister from accessing and most recently in 2003 when they publicly protested over the reverend at the time (later, he died from the stress and controversy) and walked out in droves. Bell-ringing at the church has been a tradition since they were first rung on Sunday, May 14, 1911. The bells were first suggested by Jeremiah Scott Pearman as a way to honor the church’s former pastor, Archdeacon George Tucker. The church quickly agreed and began raising the funds to purchase and install the first chime bells in Bermuda. The chime consists of ten cast bronze bells, cast by John Taylor Bell founders in Loughborough, Leicestershire. The bells range in size from 18 inches in diameter and a weight of a mere 126 pounds, to the largest at 37-and-one-quarter inches and a weight of 1011 pounds. Each bell has a different note from the key of B-flat minor, and is played on a clavier. Players simply push the numbered levers, which, when depressed, pull the wires, and, in turn, the clapper of the bell. Bell players can follow simple music notations to play hymns and songs. In addition to the chimes, there is a great bell on a swing wheel, which sits on top of the ten-bell frame. It was cast by the Memeely Bell foundry in West Troy, New York in 1879 and presented to the church by W. F. M. Whitney for Easter that year. All the bells are housed in the church’s tower and steeple, which was completed in 1876. The first person to play the bells was Sexton T. Stephenson, followed by Sexton Arthur Wilkinson, Sexton Eliston Woolridge, and then Sandra Lilley. Today, the church has six players, rotating around the two Sunday morning services held at St. Mark’s. Note how graves in Bermuda are above the ground, but bodies are six feet under ground. 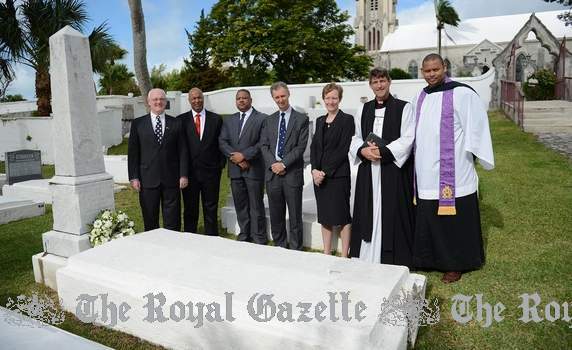 Of special interest to American visitors are the graves of a former US Consul General in Bermuda during the American Civil War, Mr. Charles Maxwell Allan (who, during the Civil War was much-reviled by many Bermudians because they supported the South. He later became much-respected) and his wife, Mrs. Marion Schuyler Allan (who died in 1909). On numerous occasions at Bay House in Pembroke Parish, Bermuda, where they lived for years, Mark Twain was a regular and popular guest of Mr. Charles Maxwell Allan, Assistant Consul General and Mrs. Marion Schuyler Allan. (In the 1860s, Allan had been a friend in Bermuda of another expatriate, the English artist Edward K. James). Mr. Allen did not return to the USA after the Civil War. He remained in Bermuda as U.S. Consul until his death in 1888. American and Canadian visitors should note that here also reposes the grave (see photo below) of naturalized American Canadian-born Professor Reginald Aubrey Fessenden - (born October 6, 1866, died in Bermuda on July 22, 1932). At the Whitney Institute school not far away, he had been the Headmaster. 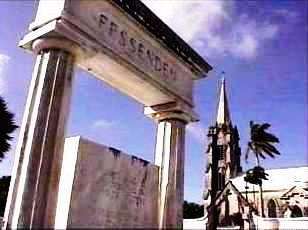 Fessenden had married a Trott (from an old Bermuda family) and in his memory there are scholarships called the Fessenden-Trott Scholarships. He made it possible for radio voices to be broadcast (Marconi's radio only did Morse code). On his grave (on a stone lintel at the top of the memorial) is inscribed: "His mind illumined the past and the future and wrought greatly for the present." When Fessenden retired to Flatt's Village (because of a heart condition) in 1928, he bought the historic house 'Wistowe' and remodeled it. Photograph of church (top) by author Keith A. Forbes. 23 South Road. Phone 236-9866. Fax 232-2824. E-mail stpats@ibl.bm. With two marked Handicapped Parking spaces. P. O. Box FL 433, Flatt's, FL BX. Appointed under the Parish Councils Act 1971. See under "Parish Councils" in Bermuda Government Boards. Appointees are political and meetings are not open to the public, unlike in the United Kingdom, Canada and USA where parish or community councils always are. On the ocean side of the South Road. 60 acres. 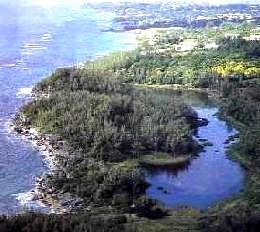 Bermuda's largest nature reserve and wildlife sanctuary. Its history began in 1954 when the Legislature authorized the first purchase of land to be set aside as public open space. 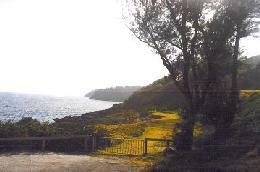 It was the first nature reserve in Bermuda. The brackish pond has a greatly reduced salt content and no permanent connection with the ocean nearby. It has no tidal range at all. But during storms, Spittal Pond can become very salty when inundated by the ocean. Like all brackish ponds, it is unstable. Lack of dissolved oxygen is common and many areas of yellow, pink or black sulphur-producing bacteria can develop. It is where wild migratory birds congregate, especially from November to March. It is the best bird-watching area in Bermuda. Many non-native birds shelter or winter here. Most prominent from the fall to the spring are Blue-winged Teal, Mallard and other duck species, Pied-billed Grebe, herons and egrets, American Coots and Common Moorhens. Wintering warbler species include Black-and-white Warbler, Ovenbird and Northern Water thrush. Resident species include Yellow-crowned Night-Heron, White-eyed Vireo and European Goldfinch. Paths and trails designate areas to explore. It is also a magnificent place for a walk for those without a mobility problem See a historic site (see below). Also see The Chequerboard, a natural curiosity. Seawater created small channels forming precise squares in the limestone. It is believed it is an ancient beach that became solidified. 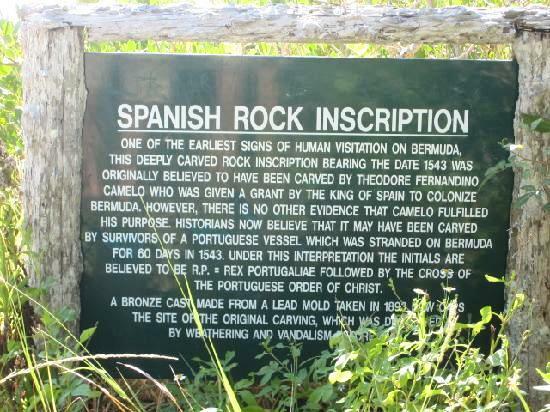 It is also unique in Bermuda as the site of what for centuries in Bermuda used to be known as Spanish Rock but which in late September 2009 was formally renamed Portuguese Rock in a ceremony attended by dignitaries from Bermuda and Portugal. The ceremony was held at the rock, which was engraved here almost 500 years ago. Portuguese Rock is a poignant reminder that Bermuda has and will continue to have strong cultural connections with Portugal and a shared maritime and international commercial history that built the foundations of the modern Atlantic world. Antonio Nunes de Carvalho Santana Carlos, Ambassador of Portugal, flew in from London for the ceremony and made a short speech. Once the new sign was unveiled, Bishop Robert Kurtz and Father Julio Blazejewski both said prayers. The Portuguese national anthem was performed on the accordion by Antonio Araujo and Wendell "Shine" Hayward played Bermuda's official national anthem God Save the Queen, on his saxophone. It was thought that the inscription 'RP 1543' was made by the Spanish who roamed the seas in the 1500s and hence it was called 'Spanish Rock.' But subsequent research indicated that the inscription was made by a Portuguese sailor who was wrecked off Bermuda's reefs in 1543. The reserve - not the pond - is open from dawn until dusk, with parking. No admission fee. 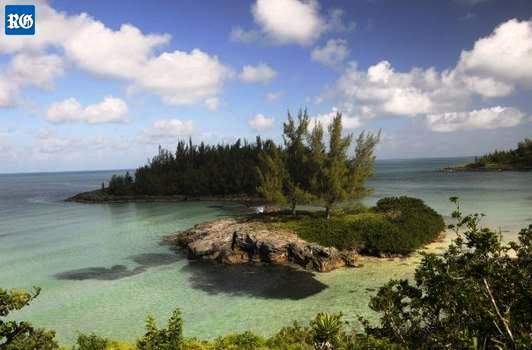 It is jointly maintained by the Bermuda National Trust, Bermuda Audubon Society and Department of the Environment which replaced the Department of Agriculture in 2002. The # 1 day time bus stops nearby. There is no evidence this has any connection with the word "spit" or spittle. Probably much more likely is a historic connection with various places named "Spittal" in Scotland, with their Scottish Gaelic origins such as Spittal in Dumfries & Galloway; in East Lothian with Spittal Hill nearby; Spittal of Glenmuick in Aberdeen-shire; Spittal of Glenshee, in Perthshire; Spittalfield, nearby and Spittal in the northernmost mainland Scottish county of Caithness. The Smith's Parish stretch of one of Bermuda's three main roads is lovely for views and sightseeing attractions. Going east, it starts off mildly, where the Devonshire Parish portion ends, just before the Church of Nazarene and Collector's Hill bearing off to the left. Another church, Centenary Methodist, is on the left with a shopping center opposite. Further east - at 23 South Road, phone 236-9866 - is the round St. Patrick's Roman Catholic Church on your left. Then you come to the junction with St. Mark's Road on the left, very rural, with St. Mark's Church prominent. After the "saintly" area, you come to the downhill and then flat coastal drive of magnificent South Shore scenery for nearly three miles. On the right, overlook the tranquil Spittal Pond Nature Reserve (described below). On the left, see the beginning of Knapton Hill, with its own "skyline drive" vistas. After the junction on the left with Harrington Hundreds Road, pass Watch Hill Park on your right and lovely seascapes of the South Shore. Cliffs, rocks, green of the vegetation, blend with the blue of the ocean and fierce action of the waves on windy days. After passing Winterhaven Nature Reserve on the left you encounter John Smith's Bay on your right. Its beauty and site will tempt you stop. Further straight on, past Devil's Hole Road to the left, pass the Marsden Methodist Church on your left, then the beginning of Mangrove Lake on your left and an access road, Somersall Road, for the H. T. North Nature Reserve which includes the lake. At this point, you've reached the boundary of Smith's Parish. Further east is Hamilton Parish. The # 1 bus stops at all the bus stops in the Smith's Parish portion of the South Road. A hill that one can walk or drive down that connects the two-way Middle Road with the North Shore Road. On the left, from Middle Road, can be seen residential houses and then the old, recently restored Bermuda Railway bridge before reaching the two-way North Shore Road. On the right, there are more homes, also Green Land Diary Farm Ltd, Bermuda’s biggest such farm. Area Member of Parliament Michael Dunkley, former premier, has a family milk business which is the sole customer of Green Land Dairy Ltd. The Green Land Dairy Farm is on government land and current owners Mr and Mrs Medeiros negotiated a 25-year lease with the Government, the first two years of which were rent-free, to allow them to make $1 million worth of improvements to what they said was a “broken-down” facility. The 13-acre site has 120 cows, compared to 160 previously, and they produce 80 per cent of the island’s milk. A small wildlife and woodland reserve off the South Road directly opposite John Smith's Bay. You'll see the sign for the facility, but not any obvious access way or path to find your own way in and out. Avoid the poison ivy. The # 1 bus stops at the John Smith's Bay stop on either side of the South Road nearby. There is limited vacation accommodation here for the handicapped in the nice Summerhaven complex for them. A-1 ( MarketPlace), Collector's Hill. Harrington Hundreds Grocery & Liquor Store, South Road, near the eastern entrance to Spittal Pond. Both are on bus route 1, not as frequent on a weekend as on a weekday. Both are open every day (call to check times) including Sunday (from 1 pm to 6 pm). Both sell liquor, but not on Sunday. 116 South Shore Road, Tucker's Town, Smith's Parish HS01, Bermuda. 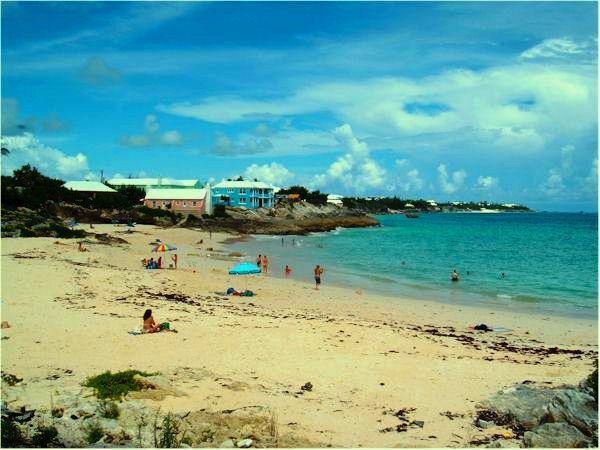 Website thelorenhotel.com On 17 landscaped acres and with two of Bermuda's spectacular private pink sand beaches. A new $51.5 million 34 room boutique hotel with two restaurants and six guest condominiums, two guest suites, two swimming pools and a residential building. 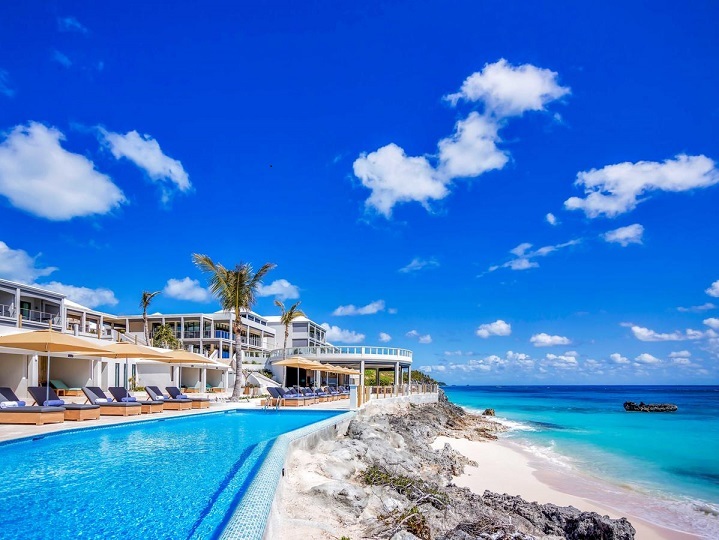 Bermuda’s newest hotel and condominium complex, in a private beachfront area, built on land that until 2014 housed the once-iconic Pink B each Club and Cottages until their receivership in 2010 and subsequent demolition. Bus route 1 by day passes below. 2017. April 24. Local and international buyers have expressed interest in seven new villas at The Loren at Pink Beach development, the selling agent said. And Rego Sotheby’s International Realty released more details on ownership of the three-bedroom properties. Penny MacIntyre, partner in RSIR, said: “Initial feedback from prospective local and international purchasers has been remarkable. “The market has been awaiting newly constructed product that has a contemporary feel reflective of today’s luxury lifestyle.” The villas, which cost $4.2 million completed and $3.8 million presale are part of The Loren’s condominium ownership programme. Buyers get access to the hotel’s private club, with a 10 per cent discount on food and beverage services, as well as access to all hotel amenities, including the spa, fitness centre and pools. The condominiums are designed with “lock-off” potential, so they can be subdivided into three separate units. All three units can be placed in the hotel inventory, or owners can opt to occupy one half of a villa, with hotel guests in the other to generate income, while owners can also opt to maintain the properties as private residences. The villas can be bought with The Loren’s furniture package or unfurnished, although properties which go into the hotel inventory are required to use the in-house furniture. Built on the site of the former Pink Beach Club, the hotel and villas stand on the waterfront and near the Mid Ocean and Tucker’s Point golf clubs. 2017. March 10. A new restaurant at the luxury Loren hotel is to open tonight. The Marée at the Tucker’s Town resort is the fine dining option at the resort, backed by the more casual Pink Beach Club. A spokeswoman for the hotel said that the restaurant would offer a seasonal and locally sourced menu under the direction of executive chef Tim Sullivan of New York’s Great Performances. The restaurant will bring in ingredients not available locally from Great Performance’s 60-acre organic farm in New York state. Mr Sullivan said: “Among its many other attributes, the Loren Hotel is a destination for ambrosial dishes that tell a story — our story, one that is fuelled by passion and imbued with a desire to promote local agriculture and a sustainable food system. To the greatest extent possible, we source our ingredients from local farms and on-island partners that we know and trust. Our love for the changing seasons inspires us to craft menus that transform along with the weather. As a portion of these ingredients is sourced from the New England area of the United States, our menus reflect both the seasonality of their local produce as well as our own here on Island. By practising this local, sustainable mindset, we support our communities and create meaningful, lasting relationships, manifested in the food that we serve.” The five-star boutique hotel opened last month and features 45 suites, as well as a spa, pool deck and corporate meeting rooms. The Loren, built on the site of the former Pink Beach Club, was created by developer Stephen King, who said he noticed a gap in the market for an upscale boutique hotel after visiting Bermuda. 2017. February 10. Bermuda’s newest hotel, The Loren at Pink Beach, celebrated its opening in style with more than 400 attendees at the launch event last night. Hotel owner Stephen King hopes other hotel developers will be encouraged to come to Bermuda when they see what The Loren has achieved. The five-star boutique hotel features 45 suites, and its amenities include a spa, pool deck, corporate meeting rooms, and fine dining and casual dining restaurants. For Bermuda residents, the restaurants are expected to be a big draw. The Marée offers fine dining, while the Pink Beach Club has outdoor casual dining. Tim Sullivan, an executive chef with New York’s Great Performances, said the menus at both restaurants will have a strong local flavor. As an advocate for using the highest quality local produce whenever possible, he has criss-crossed the island meeting farmers, fishermen and vendors to secure fresh ingredients that reflect “the full story” of Bermuda. The menus will change during the year to reflect seasonality. Any ingredients not available locally will be brought in from the US northeast, including Great Performance’s 60-acre organic Katchkie Farm in upstate New York. Kingh Engelbrecht, general manager, said the hotel will bring the highest level of service, adding that the staff were “the heart of the project”. The majority of the employees are Bermudians. Owner Mr King wants to nurture local talent in the hospitality sector and has plans to set up schemes with that goal. He also paid tribute to Simon Hodgson, a Bermudian architect, who worked on the project for three years. “I’m so grateful for his contribution,” said Mr King. When he visited the island a few years ago, Mr King felt there was something missing. While speaking highly of other Bermudian hotels, he saw the opportunity for a boutique, first-class hotel at the former site of the Pink Beach Club. He believes overseas visitors and locals will appreciate the ambience of The Loren and want to come back again. Ryan Babcock, joint owner, said guests at the launch event had expressed pride that a hotel of The Loren’s caliber was on the island. 2014. March 29. Plans to raze the Pink Beach Club and erect a new boutique hotel and condominiums were submitted for in principle planning approval. The $51.5 million development is set to include a 34-room hotel with two restaurants, six guest condominiums, two guest suites gym and spa facilities, a new beach club, two swimming pools and a residential building. The Pink Beach Club was first opened in 1947 but harsh economic conditions and a declining number of visitors forced the club into receivership in 2010. But earlier this year, it was announced that Canada-based Sardis Development Ltd had purchased the property and were committed to redevelop the site into a world class tourism destination. The developer recently submitted applications to the Planning Department, one seeking final planning approval for civil works on the site and a second seeking in principle approval for the project. An environmental impact assessment and statement (EIS) included in the application stated that almost all of the buildings currently on the site are to be demolished with new buildings being erected largely in their footprints. A section of the EIS reads: "Following the demolition of almost all existing buildings on the entire site, the western lot will be dedicated to a 34-suite five star boutique hotel with a high quality gourmet restaurant and beach grill, fresh and salt water pools and access to the western beach and tennis courts. In addition, six luxury condominiums will be built, which will offer a form of low-density residential living that provides access to all hotel services and amenities. The development of the eastern 5.5 acres will include the construction of a detached residential building with groundskeepers cottage at the extreme eastern end of the proposed lot. Two existing buildings on this part of the site will also be renovated to create two luxury guest units. The construction of the hotel and beach club is listed as being in the second phase of development, following civil works, with the construction of the spa building and residential units listed as being in the third and fourth phases of development. According to the application, the hotel will be divided into two three-story buildings located on the south west of the property. The beach club will sit to the south of the hotel buildings, while a separate spa building and facilities building will be erected to the north. The condominium buildings to be built on the site are two story in height, and will reportedly be comparable in size to the existing cottages on the property. The project also includes a rehabilitation of the existing reverse osmosis plant, a new sewage treatment facility, parking for 54 cars and 52 bikes and new accesses to South Road. While the proposed hotel has significantly fewer rooms than the existing club, which had 94 rooms, the smaller scale is hoped to create an intimate and exclusive feeling while reclaiming a significant quantity of open space. The first stage of the project, consisting of the hotel and condominiums, is estimated to cost $44 million, while the residential and guest accommodations will cost a further $7.5 million. The EIS stated that the design details for the building have not been finalized, but the architecture of the buildings is intended to be Bermudian in character. The report also estimated that between 80 and 100 jobs will be created during the construction phase of the project, while around 56 people will be employed on the property once the hotel opens its doors. Tourism Minister Shawn Crockwell said the progress of the project was good news for Bermuda, adding that there are several other projects also in the works to reinvent and reinvigorate the tourism industry. "This Government was elected to revive our economy and create jobs, Mr Crockwell said. The planned renovation of the Pink Beach property will bring foreign investment to the island and create local jobs in both the construction sector as the property is upgraded and in the running of the hotel once renovations are complete." Bermuda Environmental Sustainability Taskforce (BEST) chairman Stuart Hayward said that the group is pleased to see the resurrection of the tourism site. "Our preliminary comments are mostly favorable. We particularly appreciate the inclusion of an EIS as part of the application. This process augurs well for the future as our Island becomes more densely built-up. We also applaud revisions to the original plans that indicate the new owners intent to protect and reactivate the agricultural land at the site. The development will likely be welcomed by the construction and hospitality sectors, but in some other hybrid hotel and residential projects the residential units were built but not the hotel. We trust there will be an irrevocable agreement to build the hotel and have it operating before any private residences are built." 2013. July 29. The Pink Beach Club is to be sold — and restored as a luxury hotel by 2015. The deal, approved by MPs during Friday’s House of Assembly, comes three years after the Tucker’s Town resort was placed in receivership. Sweeping concessions were offered for the $12.5 million sale, but Government defended its bargain as crucial for sealing the deal. The South Shore hotel has “long been synonymous with the storied success of Bermuda’s tourism industry”, Tourism Minister Shawn Crockwell told the House. PBC Holdings will purchase Pink Beach, which will be managed by the international chain Capella Hotel Group, in return for tax concessions totaling $6.5 million. The tax breaks add up to $1.3 million annually, spread across five years. Mr Crockwell said the Smith’s property will be converted to a five-star resort with more than 200 employees by 2015, adding: “They will endeavor to open next May, 2014, with most of the hotel.” The Minister called on MPs to act with “the urgency of now”, saying that with the Island’s hotels full but airlines coming in at 50 percent capacity, “something is wrong.” Shadow Minister Wayne Furbert said the Opposition welcomed the deal — but other Progressive Labour Party MPs questioned some of the terms negotiated by Government. Calling the tax breaks “a serious giveaway”, independent MP Terry Lister likened the arrangement to a “50 percent off sale”, adding: “Where do I sign up? This sounds like something I want a piece of too.” Mr Lister also queried how Pink Beach had obtained a more favorable deal than concessions offered to the Fairmont Group. However, the One Bermuda Alliance’s Grant Gibbons countered that the deal represented “a match made in heaven”, since Capella Group is known for high-end resorts. Dr Gibbons said the buyers would be acquiring a property currently in receivership and needed a “sweetener up front” — but that the new hotel would bring long-term revenue to Bermuda. “Even though we have had to provide more concessions, perhaps it’s wrong to say ‘concession’ — really, it’s financial stimulus.” In response to charges that the deal could have been negotiated better, Dr Gibbons told MPs: “One hundred percent of nothing is nothing. From our perspective, if these concessions were not given, we would not be getting anything.” PLP MP Michael Scott declared his support, telling the House that arguments over matters like entertainment spending should be left until later. “For heaven’s sake, let’s get the hotel up,” Mr Scott said, noting that concession legislation passed by the PLP was concerned solely with driving development. In response to questions from Mr Furbert, Mr Crockwell revealed that Pink Beach currently employs 35 Bermudians and eight non-Bermudians. In two years, it is estimated that the hotel will employ 192 Bermudians and 23 foreign workers, to a total of 215 — about 173 new jobs. “We need to welcome this development with open arms,” Mr Crockwell concluded. The order got unanimous approval by MPs. By press time last night, the Ministry of Tourism had declined to specify which investors made up PBC Holdings — but The Royal Gazette understands that the group isn’t linked to the Florida-based company of the same name. Who are PBC Holdings? A Butterfield Bank spokesman last night confirmed the bank had received a letter of intent for the sale of Pink Beach Club. The spokesman called the buyers, PBC Holdings, “a holding company established by a private investor group. We cannot speak for the purchasers or Capella regarding their plans or timeline for renovations to the hotel.” Capella Hotel Group has been appointed managers for Pink Beach, which is to undergo extensive renovations. Capella, founded in 2002, bills itself as a stickler for service. The company’s website lists five hotels of its own, in Germany, Mexico, Singapore and Washington, DC. Capella also specializes in hotel and spa management. The group is headed by Horst Schulze, former president of The Ritz-Carlton Hotel Company. Government MP Grant Gibbons called Mr Schulze “an absolute perfectionist” when it came to training. Under a deal approved by Parliament, the company has committed to training Bermudian employees up to a yearly amount of $346,125 for five years. Useful website: www.capellahotelgroup.com. Off Harrington Sound Road. Bermuda's highest point, 76-79 metres or 249 feet high. A very hilly excursion, best tackled on a moped. You get a glorious view as far as Gibb's Hill Lighthouse and the Royal Naval Dockyard to the west, and St. David's Island, in St. George's Parish, to the east. It was named because it was the only hill that gave a clear view of the town of St. George far to the east, then Bermuda's capital, for signaling purposes. In the days before radios, telephones, televisions, etc., a high commanding view such as this one provided a method of quickly signaling what ships had arrived, or were about to depart from the town, and other news. Ships entering or leaving St. George's Harbour were contacted by the signal station once built here. In 1937, on August 29, The West India and Panama Telegraph Company Ltd opened a new high frequency direction-finding station here, to supply long-range bearings to aircraft and ships. In 1949, on May 15. Cable & Wireless closed down its high frequency direction-finding station here, at the same time as it ended all its telegraph Air/Ground services .Later, it was used by the US military and NASA in the days of the US base at St. David's from 1941 to 1995. Book: Verdmont: The Story of a House, Its People and Its Contents. An Historical House Guide Book. Diana Chudleigh. Bermuda National Trust, 2011. Pages: 44. Paperback. Illustrations in colour. Tells the story of this early 18th century house in Smith’s Parish, and the families who lived in it. Top of Collector's Hill, at junction with Sayle Road. Phone (441) 236-7369. Owned by the Bermuda National Trust which, in 2003, was given a major award by the American Society of Travel Writers (SATW) for the restoration of Vermont. 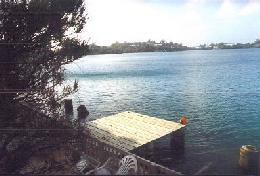 SATW visited during its 2001 Annual Conference in Bermuda. Georgian style and three floors. With rose and flower, herb and mixed period gardens. Both the house and garden are open to the public at specific times. With a parking area for the able (no Disabled by Permit Only parking signs). Admission is Tuesday through Saturday (except public holidays) from 10.00 am to 4:30 pm. The house has four chimneys with fireplaces in all eight rooms. It has a superb collection of antique Bermuda cedar furniture and valuable mahogany. Other period artifacts include English and Chinese porcelain, Georgian silver including pieces by Bermuda silversmiths, portraits in oils, children's furniture and toys. Also see a fine Bermuda cedar staircase, an Oriental room, powder rooms (once used for powdering wigs, not faces) and toy nursery. Its Bermuda cedar furniture pieces were built by local craftsmen from 1700 to 1820. The house has its share of resident ghosts and ocean views. It was a private residence until 1953. It was never plumbed or electrified. There is no kitchen or running water or air conditioning or ceiling fans or heating. It is a unique example of early Georgian architecture. It has remained architecturally unchanged since the late 1700s. It is on the site of an older - former - house acquired and added to later in his life by late 17th century Bermudian visionary, Captain William Sayle (in whose honor Sayle Road nearby is named). Governor/Captain William Sayles and the Eleutheran Adventurers sailed from Bermuda in 1648 and settled the Bahamas. Governor Sayles served three terms as Governor of Bermuda before becoming the first Governor of the Bahamas and first Governor of Carolina (before it was split in two as North and South Carolina). It was re-built in 1710 by John Dickinson. Later, it was acquired by Hon. Thomas Smith who, as Collector of Customs, spawned "Collector's Hill" both as the name of the house and the main nearby access road (another is Collector's Close. Later yet, it was acquired and added to by the USA-born portrait painter and loyalist judge John Green from Philadelphia who married one of the four daughters of Thomas Smith. He and his wife and four daughters were all painted by Green. Later, Green acquired it himself and promptly called the property "Verdmont" as a French pun on his surname, combining the word for green and mountain. The property had a different name before then. It has been Verdmont ever since. In the mid 19th century, the house and its 50 acres passed through descendants of Elizabeth Smith and her husband Colonel Henry Trott. They sold it to gentleman farmer Rupert Spencer, whose great-niece Lillian Joell was the last person to live in the house. She declined to modernize it and lived there without electricity or plumbing. 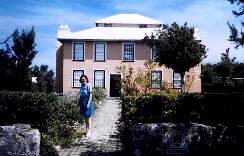 In 1951, she sold the property to the Bermuda Historical Monuments Trust, forerunner of the Bermuda National Trust. The name also prompted other roads built since then to be known as Verdmont Road, Verdmont Drive, Verdmont Lane, Verdmont Valley Drive, Verdmont Valley View and Verdmont Valley Close. Also, because the Verdmont estate was once hugely bigger than it is now and centuries ago stretched between the South and North Shores, further variations of the Green name were made - and have stuck - at Green Hill Lane not far from the North Shore, at the top of Store Hill where it intersects with Middle Road; and Green View Lane, near the foot of Collector's Hill on the South Shore. Friends of Vermont. A group that meets monthly. In October 2013, a descendant of the last family to live at historic Verdmont in Smiths visited the Island after a 61 year hiatus, and helped to shed new light on the old place. Connie Maxson, great granddaughter of Stafford Nairn Joell (1846-1911), arrived in Bermuda by cruise ship with her husband, Kennon. She was raised in the United States and last visited Bermuda in 1952 at seven years old with her brother, Granville, and mother Gladys Paultisch Wright. When Mrs Maxson first saw the house, there was no one living there. She dimly remembered a cherry tree out back with delicious cherries. Mrs Maxson's mother, Gladys Wright, was the daughter of Emma Constance Joell and Fredrick Paultisch, an American. Mrs Maxson is named Constance, after her. Mrs Wright was born overseas and was the youngest of three daughters. Her mother, Emma Constance, became very sick and the family returned to Bermuda thinking it would be better for her health. Sadly, she died soon after returning to the Island in 1910. Mr Paultisch, a steel yard worker, went back to the United States leaving behind his three daughters to live at Verdmont with their aunts, Lillian and Irene (Dolly) Joell. Mrs Maxson's mother, Gladys, was just four years old. It was 1911 and he felt that he could not raise his daughters on his own. Eventually, Mr Paultisch remarried and his daughters gradually returned to the United States to live with him. Gladys was the last to leave, but finally followed her sisters at the age of 14. It appears that at one time there was an open wooden veranda along the entire south front of Verdmont. This was something that the BNT did not know, and they have now researched..
On the South Shore, below the southern brow of Knapton Hill. Its little cliff-side public path and parking area leads off the South Road, about a mile east of St. Mark's Church, overlooking the ocean. The # 1 bus stops nearby. Stop and admire the stunning sea views. Watch Hill Road is nearby and both have the same historical significance. In the early days of Bermuda, fear of a Spanish attack resulted in the passing of a local law - based on British law of the time - requiring every parish to maintain a 24-hour watch. A system of signal fires was used to alert other high or strategic points beyond the parish. This is how the name started. The park is prettiest on the eastern, turfed area, where there are great picnic spots. On days when gale force winds are from the south, great waves hurl themselves onto the rocks below with such force that sheets of spray rise high into the air and spill into the park. A small, wildlife and woodland reserve open to the public. One entrance is just off the South Road between John Smith's Bay and Watch Hill Park. The # 1 bus stops at John Smith's Bay nearby. The other is in and overlooks Harrington Sound Road. The #3 bus stops nearby. The nature reserve runs between the two entrances. For seascapes, the south side of this reserve is lovely. The north side, over Harrington Sound, is as nice. Within the property, on the south side, is the historic former Winterhaven Farm House, dating from the 18th century, a fine example of traditional Bermudian architecture. It was owned until recently by the Bermuda National Trust but was sold to Bermuda's former Premier Dr. The Hon Ewart Brown, and is now the Brown-Darrell Clinic, a medical stem cell research centre opened in 2008.